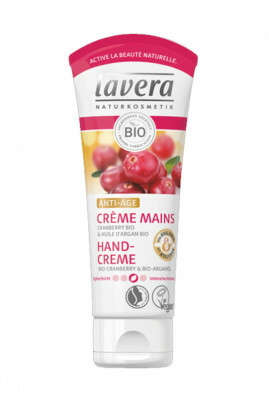 Lavera Vegan Anti-Age Hand Cream is specially formulated to moisturize and protect mature skin. Rich in organic argan oil with active anti-aging and antioxidants, it fights against the signs of aging skin while providing nutrition and flexibility to your hands. This effect is reinforced by organic cranberry extract with protective and soothing properties. Thanks to its creamy and non-greasy texture, it penetrates quickly. Your hands are soft and protected for the whole day. Vegan Anti-Age Hand Cream is ideal for mature and dry skin! As soon as you feel the need, apply this care regularly on your hands. Feel free to massage your hands for a moment of sweetness !